Make The Place You Live, The Place You Love. The homes in Founders Pointe are designed and custom built to create an overall architectural appeal that is immediately sensed when you drive through the community. The variety of home plan sizes, styles, and designs are limitless. Let one of our award-winning custom builders help you create the home of your dreams. Prior to construction, each home plan is submitted to the Founders Pointe Architectural Review Board for approval. Here the exterior of the plan is reviewed, including design elements, exterior finishes, site plan, and landscaping design. The creation and enforcement of these standards helps to protect the investment of every homeowner in the community. Many of these home designs are from nationally renowned architecture firms. 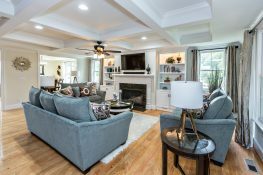 You can select from the our featured builders’ custom plans or from nationally awarded home designers such as —Frank Betz Associates, Inc., William E. Poole Designs, Inc., Stephen Fuller, Inc., Living Concepts and Garrell & Associates, Inc.